Chocolate Covered Cherry Brownies - seriously delicious!!! 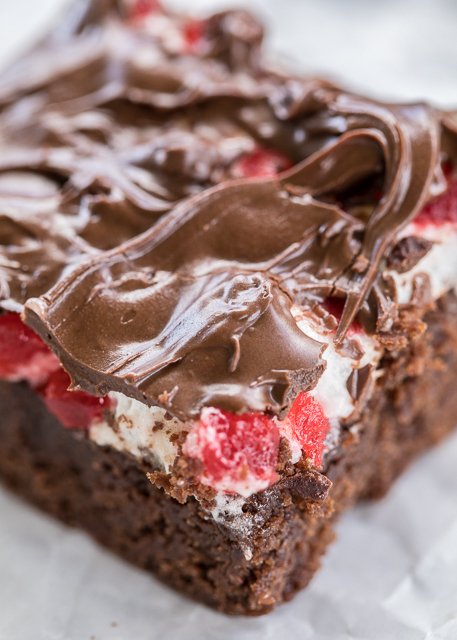 Homemade brownies topped with marshmallows, maraschino cherries and chocolate. Great for parties and a festive homemade holiday gift! I took these to a party and everyone asked for the recipe! SO good!!! Sugar, flour, cocoa, baking powder, salt, butter, eggs, marshmallows, maraschino cherries and chocolate chips. Christmas is all about the sweet treats in our house. These Chocolate Covered Cherry Brownies are a favorite! 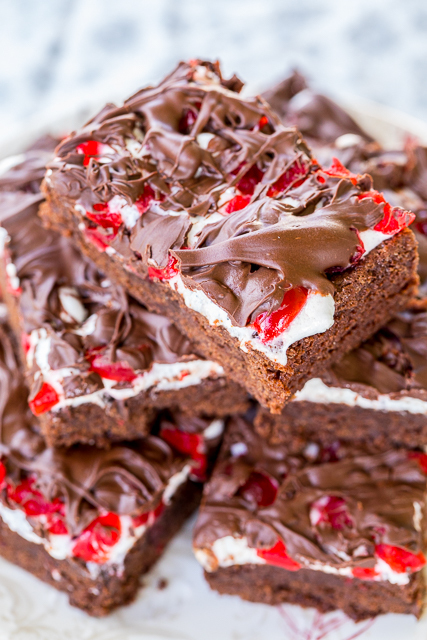 Homemade brownies topped with marshmallows, cherries and chocolate. SO good!!! They are also so very festive for the holidays. I added a touch of almond extract to the brownie batter. I think it goes great with the maraschino cherries! These Chocolate Covered Cherry Brownies are super simple to make and they taste fantastic. They would be great for holiday parties or a delicious homemade holiday gift. Make a batch of these brownies in a foil pan and pop a bow on the lid. Perfect! 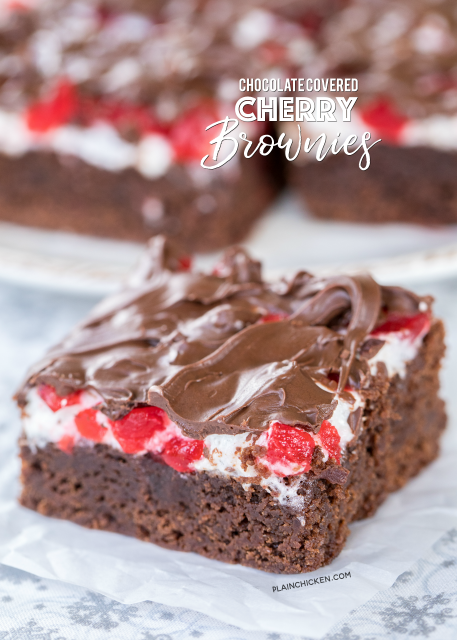 I am a huge brownie lover and these Chocolate Covered Cherry Brownies are the best of the best! 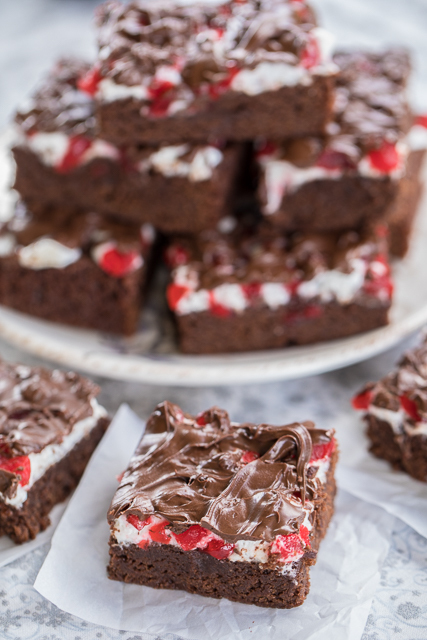 The brownies taste great on their own, but the marshmallows and maraschino cherries really put them over the top. Make a batch today! I promise they will be a hit! Combine sugar, flour, cocoa powder, baking powder and salt. Add melted butter, vanilla, almond extract and eggs. Stir until smooth. Pour into prepared pan. Bake for 28 minutes. Remove from oven and sprinkle marshmallows over hot brownies. Bake an additional 2 to 3 minutes. Remove from oven. Sprinkle chopped cherries on top of marshmallows. Cool completely. Place chocolate chips in a microwave safe bowl. Microwave on HIGH for 1 minute. Stir until chocolate is smooth. Drizzle melted chocolate over uncut brownies. Let stand until chocolate is set. Cut into bars. This sounds right up my husband's taste bud alley. He loves all parts of this. I'm going to have to hurry up and make it! These are amazing and very easy to make. Thanks so much for the recipe! Do these need to stay refrigerated and what is the shelf life? I did not refrigerate the brownies. I just stored them in an air-tight container. They will last up to 4 days.